Find out what Xur is selling for December 8, 2017, Week 14. Xur is back for the first time since the Curse of Osiris released, and everyone in the world was hoping that he’d bring the very broken Prometheus Lens exotic trace rifle. Well, good news, Guardians, because the PvP is about to be as broken as imaginable until the Prometheus Lens is patched next week. Xur is on Earth. Spawn in at the Winding Cove on the EDZ and go past the public event that spawns there. Just up the hill you’ll find the Agent of the Nine hanging out and spouting off his nonsense. Xur is selling a single weapon and three armor pieces, one for each class. Each armor piece costs 23 Legendary Shards, and the weapon 29 Legendary Shards. 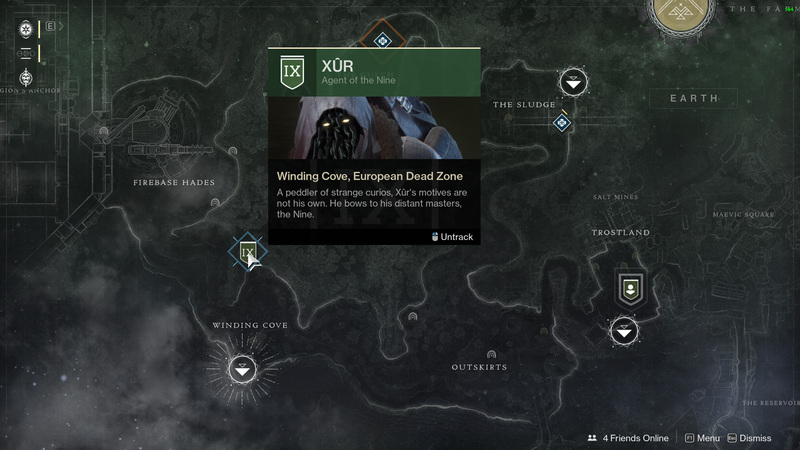 This means it will cost you 98 Legendary Shards to collect everything that Xur is selling this week. All of it. Buy anything that you don’t already own. These items are going to go through more balances and tweaks over the weeks and months, so what’s bad today will be good tomorrow. You should make sure to collect all exotic armor and weapons. 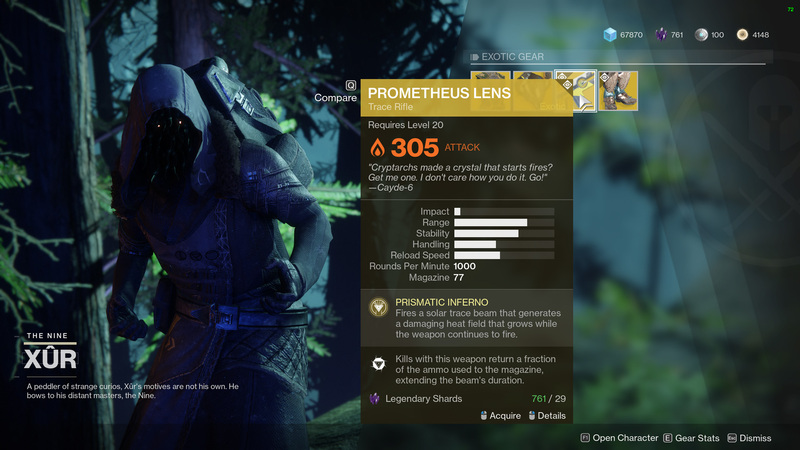 If you’re on a budget, make sure you get the Prometheus Lens, and after that go for any armor that is missing, starting with your main class and working towards your weaker classes. Remember that Xur is around for a few days, so you have lots of opportunities to earn Legendary Shards and get all his inventory purchased.